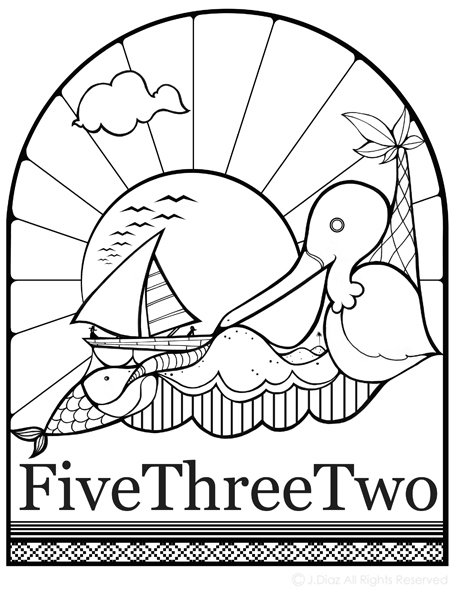 Five Three Two, otherwise known as Jay Diaz, is a graphic artist, who specializes in creating interlocking linear narratives. His illustrations are composed of thoughts and situations, directly referenced from his own life’s journey. Diaz has produced custom designs for a wide-range of clientele spanning from traditional companies to non-profit agencies. Similarly, the usage is just as versatile. Various applications for his art include, but are not limited to, silk-screened apparel, canvas & prints, and limited edition merchandise. With a growing catalogue, he welcomes the opportunity to work alongside like-minded individuals who seek to push further the quality and standards of their craft.